Most of my readers know I like to read books about World War II when it pertains to Nazi Germany or the Holocaust. That time in history is just so full of information I could just read about it everyday, watch movies, hear stories, see pictures, I think you get the idea. This book was more about Zosha's life and her story of fighting back, never giving up. The author did a great job of blending what she perceived to have happened and what actually happened from records, stories, and people who knew Zosha. Very different then what I am used to reading but still hit the mark on what I like to read about and gave me a glimpse into a another life during this time in history. A sad time were tragedy happened along with gains in science medical practice, etc, all in the name of genocide. We can all be thankful for things that happened during this time while mourning the deaths of so many innocent people who should have had a right to live on to be able to tell their own stories. People like Zosha stood up and tried to help others even if it cost her the very life she lived. A great book that any Heroine lover will enjoy. I only wish to be as strong as this lady if the day ever comes for me to stand up for what I believe in. You can find Codename Zosha on Amazon. 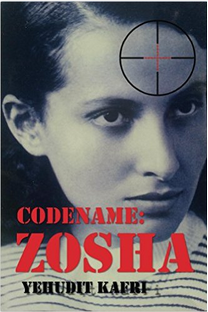 Zosha Poznanska is an unsung Jewish heroine of World War II. Born in Kalisz Poland, she immigrated to Eretz Israel as a pioneer and for a brief time belonged to the group that founded Kibbutz Mishmar Ha'emek. Afterwards, she joined the Palestine Communist Party (Palestiner Kumunistishe Partie in Yiddish, abbreviated PKP), and from 1930 until her death she lived in France and Belgium. On the eve of the war she was recruited into the Soviet spy network known as the Red Orchestra, which operated in Western Europe. Zosha was part of the inner core of the network, a third of whose members were Jews. Apparently unaware of the Jews' participation in the Red Orchestra, Hitler declared, "The Bolsheviks surpass us in one area alone: espionage!" and he commanded his counterspies to eradicate this network at all costs. This book tells the story of Zosha Poznanska through all the chapters of her short life: childhood, the Hashomer Hatzair youth movement in Poland, Eretz Israel and the PKP in the 1920s, Europe in the 1930s and the Red Orchestra. It tells of her loves, her relationships with family and friends, her daring activity in the Red Orchestra and her heroic struggle in a Gestapo prison. The State of Israel posthumously awarded Zosha a medal of honor for fighting the Nazis. The book is written as a biographical novel and relies on exhaustive research; all fictional passages are derived from and based on extensive documentation. Disclosure: MarksvilleandMe received one or more of the products mentioned above as part of a promotion with Tomoson and Yehudit Kafri. Regardless, MarksvilleandMe only recommends products or services we use personally and believe will be good for our readers. Some of the links in the article may be “affiliate links.” This means if you click on the link and purchase the item, I will receive compensation. If you would like MarksvilleandMe to review a product or service please contact us at marksvilleandme@gmail.com.